This weeks’ Cinema Static Classic Reflections film will be The Time Machine (1960). The film stars Australian actor Rod Taylor as George (in the book he’s simply called “the Time Traveler”) and a very young Yvette Mimieux as the Eloi Weena (she turned 18 during filming), plus Alan Young as Filby and Sebastian Cabot and Whit Bissell as George’s dinner friends. The story is very close to the novel with a few changes that probably made it easier and less expensive to film plus to also make it more receivable by American audiences. 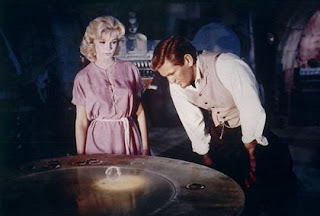 Yes, it was made in the 60s, but this is one of the most classic sci fi films of all time (pun intended). It even has a memorable music score by local musician/composer Russel Garcia. (You can basically skip the 2002 remake even though it was directed by Wells great-great grandson. It was nothing like the book and very boring. One nice thing about the newest DVD release is a short “making of” film with Rod Taylor. 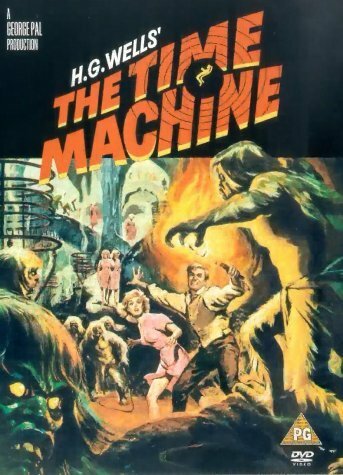 There’s the wacky story of how the original prop for the film, the actual time machine itself was bought and sold and disappeared until one day a sci fi buff and I think, designer (don’t remember his name) walked into a thrift store in the LA area and found the machine-or what was left of it- for sale! He bought it and lovingly worked to restore it back to its original self. Unfortunately some of the design drawings were no longer available but it was finally brought back to life and is on display somewhere.